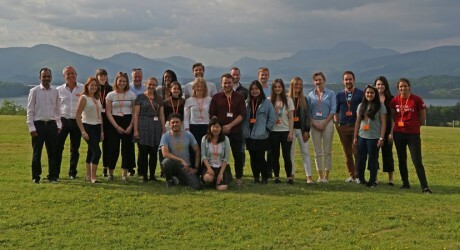 SOME of Scotland’s brightest students met a special two day innovation retreat at Loch Lomond on June 6-7 for the final of the Scottish Institute for Enterprise’s ‘I’m an Innovator’ competition. The competition encouraged students to trust their instincts and ideas for making a difference to Scotland, taking inspiration from Scotland’s history and some of the most exciting young entrepreneurs who have worked with SIE since 2000. The finalists honed their ideas over the two days and made their final pitches to competition judges. Fiona Godsman, CEO of the Scottish Institute for Enterprise, continued: “Through our work with Scotland’s universities and colleges, we help ensure that students can access some of the most cutting-edge concepts in enterprise education and really compete on a global stage. For nearly 20 years, SIE’s early interventions have supported some of Scotland’s most exciting success stories, such as TRTL, Mindmate, Pick Protection, VH Innovation and many more. SIE’s proven mix of gateway competitions, one to one support and market-leading education programme utilises some of the most cutting edge thinking in enterprise education and helps innovative mindsets thrive. Since 2000, the Scottish Institute for Enterprise has championed entrepreneurship with a Scotlandwide programme of activities to complement and support student enterprise and innovation in Universities and Colleges. SIE plays a vital role in the entrepreneurial ecosystem, identifying and supporting ideas at an early stage and ensuring they receive the assistance and encouragement they need to continue to develop and thrive. Many of Scotland’s biggest recent success stories came out of early work with SIE, such as Snap40 and Pick Protection, and in the last year alone, SIE alumni have secured over £6.5 million in funding and additional awards. SIE is supported by the Scottish Funding Council and is part of the Scotland CAN DO framework. ‘I’m an Innovator’ is a national enterprise competition open to all current university and college students studying in Scotland. The entrants were asked to submit ideas which could make a positive difference to Scotland. SIE’s annual national enterprise competitions are designed as a gateway to entrepreneurship and many participants go on to further success with high profile competitions such as the Scottish EDGE. Founded in 1887, Marks & Clerk is one of the world’s leading intellectual property practices. With offices across four continents and professional services covering patent and trade mark attorneys, solicitors and consultants provides award-winning support for change-makers across the world. MEDIA RELEASE issued by SIE. You too can share your stories (aka press or media releases), on this site. Email here for more information.